OK – More on Scifoo Camp – Day 2. And here was definitely my first big mistake of the meeting. I went to the one on Ocean Exploration — even though I had sworn to not go to things I knew a lot about unless I felt like I had to go. Here I did not have to go. But I went and though I am sure others in there found it very interesting, it was mostly stuff I knew a lot about (I have on and off done studies of microbial diversity in the oceans and deep sea). I guess the one highlight for me was discovery of Earthbrowser. Session 5: Here were the choices (which I pulled from the Scifoo web site – but one was left off – we had planned a session for the second half on Terraforming). Display of Greater than 2D Data or Lots of 2D Data All at Once Tamara Munzner. Squishy Magnets, Talking Paper and Disapearing Ink: How can inventables.com open its doors to kids for free? Since I was planning to go to a session half way through I was not sure which to do for the beginning and so I went to “Prioritizing the Worlds Problems” – a discussion led by Bjorn Lomborg about a new book he is working on. Basically the deal is – he and a bunch of economists thought a bunch and picked 10 world problems that might be solvable: climate change, communicable diseases, conflicts, education, financial stability, corruption in government (or something like that), malnutrition and hunger, sanitation and water access, and subsidies and trade barriers. And then they did an exercise basically asking – if you could spend some money in the next five years, could you solve any of these problems. He had some skeptics in the audience (which is not surprising given the semi-controversy over his book the Skeptical Environmentalist). For example Richard Jefferson of CAMBIA said that these were symptoms not problems and someone else said that it was bad to encourage governments to think on short time scales like a few years. I had to leave early for my Terraforming session and wished I had stayed. Not sure what I thought about the exact details of what he was presenting, but he was certainly not the demon some people implied he would be. A bunch of us met up outside the room where we were to have our Terraforming session only to find out that the occupants of the room were apparently circling the wagons and would not let us in. So we did the scifoo thing and took over the lobby area – doing an excellent job of sofaforming and chairforming. Then we had a discussion of Terraforming with SciFi writers and scientists and technology folks and reps from NASA. It was a pretty good discussion. In the end we concluded that if there is to be a Terraforming effort it should be on a near Earth asteroid encosed in some type of shell to retain gases. Sort of Biosphere 4 or something like that. Now we just need an asteroid. For this one I was completely torn. I really wanted to go to Noel Gorelicks discussion of Google’s efforts to collate scientific data. But then I remembered my vow to stay away from things I might know something about. So I went to a session on MicroUAV. That is, small unmanned aerial vehicles. Holy *$%$. This was the best session I went to. Simply put – it was incredible. The leader (who I found out later was Chris Anderson the editor in chief of Wired) showed the evolution of his attempts to make cheap small UAVs. Here is the deal. He started off with trying to figure out all the things he would need to make robust small UAVs – and originally pieced together multiple various gizmos to control the planes and do things like communicate with ground and get GPS signals and take pictures. 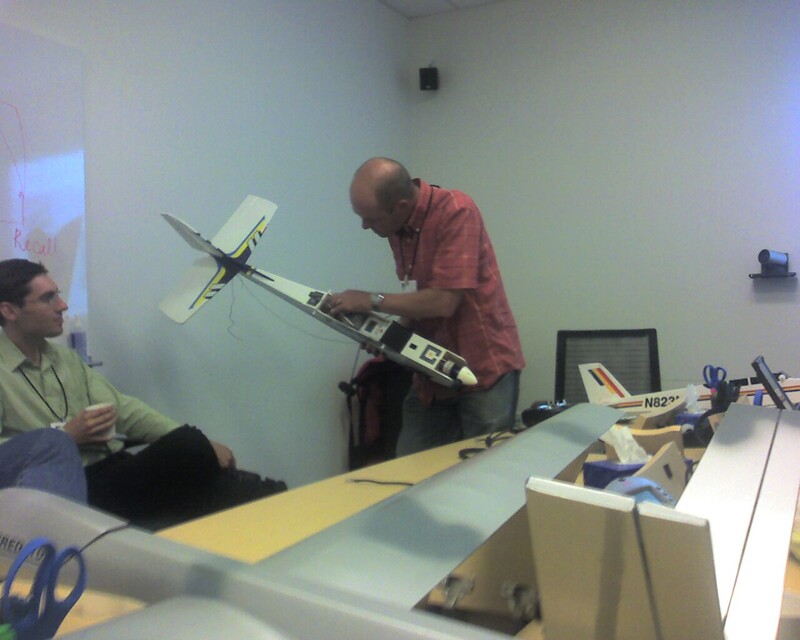 And then he realized he could use a GPS enabled cell phone with a CAMERA for all the functions and this helped reduce the costs of the planes such that one can now make one for < $700. Really. 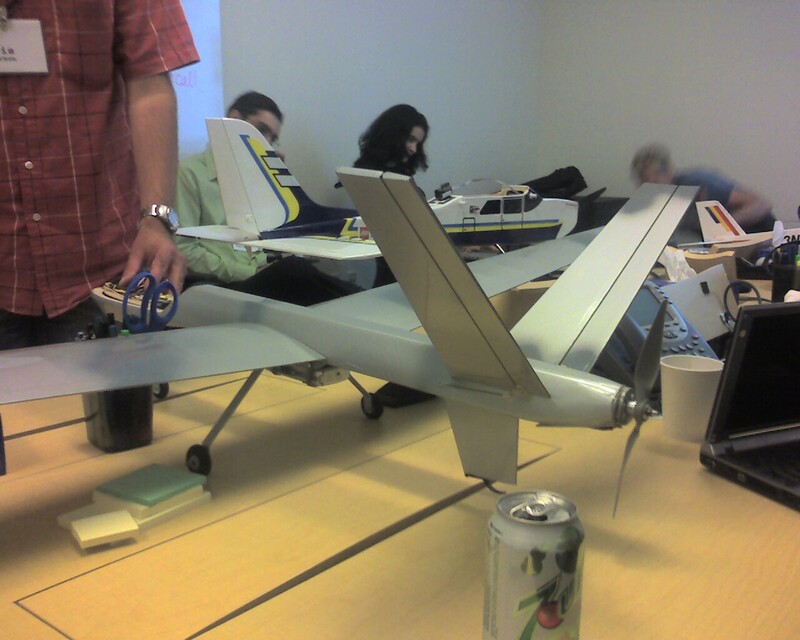 See DIYDrones.com. Buildings engergy use and behavior change – can the built environment be an interface? And here I chose to see what Martha Stewart had to say about the Paperless Home. Just before the session, Bora asked her about whether that meant no toilet paper and she responded by saying everyone should use bidets (really). She started off really well I thought – saying that homemakers are underserved by technology. She also complained about organizers made by other companies including Microsoft and said her plan was to make a better organizer for the homemaker. She also said that people need this because they need time for their families and she mentioned that many men spend less than 15 minutes a day with their kids. She also said she wanted this to help support the family unit, whatever that family was (referring back to her introduction when she said that the family has changed a lot but not saying that she thought new family structures were bad). She did say she considers herself a typical customer for such an organizer – which made many people literally groan. Yes, Martha, with her 100s of millions of dollars, her boyfriend who pays 30 million to go into space and her many homes and giant houses and teams of assistants, she is the perfect customer. She did make some insightful comments about home technology like “I don’t mind my talking to my computer but I do not want my refrigerator talking to me” when she was complaining about all the noise some gadgets make. Then she said nobody wants a drier that buzzes when it is done (I agree with her that this is annoying). She then asked the crowd if anyone wanted the buzzer and Paul Ginsparg said yes. So she skeptically dissed him and asked him why when he could just wait a little bit and put in the load a bit later. So he said “He wants to get another load in as fast as possible so he can spend more time with his kids”, referring back to her comment about fathers not spending time with their kids. She knew she had lost this argument and she moved on to another topic. She also said she wants scents out of the houses, which I agree with too. And she told a bizarre story about some worker who came over to her house with smelly pants because he had used a smelly dewrinkler. And she made him go and change into a new set of clothes because he smelled so bad. In the end, I guess I agree with Anna Kushnir in her brilliant “Letter to Martha” that she missed a chance to get technogeeks interested in helping the homemaker. I felt this was happening and asked her a leading question trying to get her to say something about what technogeeks could do to help but she misunderstood and answered some other question. In the end, I am glad I went to her talk — it was off the beaten path and memorable even if it was not technogeeky enough for me. Then we had another googlelicious dinner. I cannot for the life of me remember what I did but I guess that is OK.
Nanohype: The volumnious vacuous vapid world where only size matters. de ranging discussion of biohacking, biodefense, biosafety, etc. I am not sure everyone came out with the same conclusion though. I came out thinking — we should not worry about biohecking compared to normal pathogens. But many other people said later they came out of it scared about hackers making nasty viruses and killing us all. I mean – I think the community should worry a bit about genetic engineering and put into place safeguards against terrorists and accidental released. But I still worry more about MRSA and XTR TB and so on. And thus ended the sessions. We had a reception and then at around midnight people went back to the hotel and some continued to linger for many hours … I only lasted til ~ 1 am.